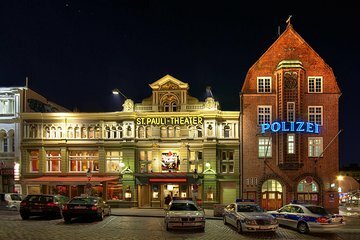 Explore one of Hamburg’s most vibrant districts by night on this 2-hour St Pauli evening walking tour. Follow a guide along St Pauli’s bustling streets as night falls over Hamburg, and watch as the city’s party-lovers come out to play! Along the way, gain insight into St Pauli’s colorful history, and hear legends and tales from its checkered past. Sample German beer in the Ritze — a local boxing club-turned-bar — and stroll among the neon lights of the vibrant Reeperbahn. Then, finish your tour in style with a delicious Kiez liqueur. Die Führung durch St.Pauli war sehr interessant.